The red planet's brutal landscape poses problems for lightweight solar panels. From the surface of Mars, the sun looks a lot different. For starters, it’s much smaller and fainter, because it’s 1.5 times as far from the the red planet as it is from Earth. But that doesn’t diminish how crucial solar power will be to the Mars settlements of tomorrow. 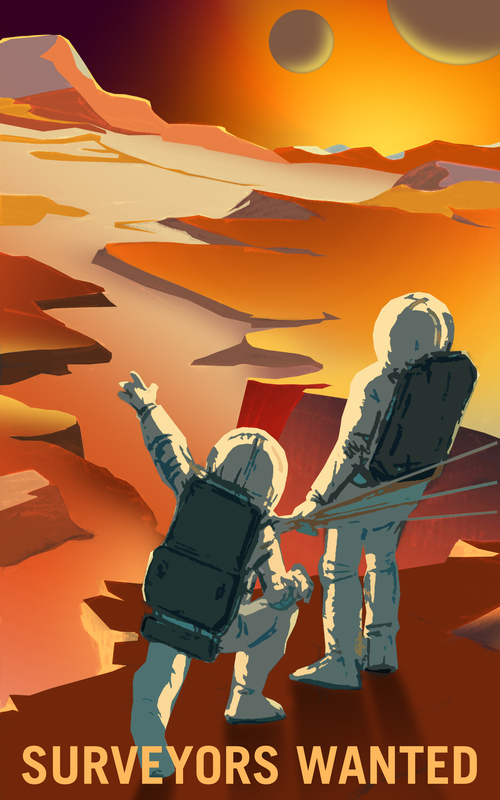 In a presentation earlier this year, Michelle Rucker of NASA’s Mars Study Capability Team suggested that solar energy is the best option for a human mission to Mars (set for the 2030s), but harnessing the power of a distant sun in a toxic environment poses a slew of challenges for NASA — it’s working on more than 40 different technologies — and the private sector that will be contracted to build Mars infrastructure. One such private-sector partner is Clark Weidetz, an executive at Siemens — the company whose software is in the Curiosity Mars Rover — about how we might be able to navigate those challenges. Living on Mars will represent perhaps the greatest challenge humanity has ever faced, but many of the solutions to the problems we will face are just evolved versions of issues we’ve already figured out on Earth. NASA's Spirit rover covered with dust. 1. How will the solar panels be dust-proof? “Having some kind of a self-cleaning system that would be embedded into the panel process would be neat,” he continues. “What we do here in the States is we increase the number of cleanings during certain parts of the year where those panels get extremely dusty and dirty.” Cleaning panels on Mars would be more difficult to do manually, so Weidetz says it’s more likely the panels would need some kind of built-in mechanism to handle that task. Solar arrays from behind on Mars, as imagined by Siemens. 2. How will solar panels stand up to the winds of Mars? “If you’ve got significant wind problems, those solar panels might blow away,” Weidetz says. Basically, we’ll have to make sure that the arrays are light enough to bring over from Earth, but heavy enough to withstand the occasional gale-force winds. What it might look like to peer down at a microgrid on Mars, as imagined by Siemens. 3. Can solar panels build themselves autonomously? Setting up a microgrid on Earth, where we have ample tools and resources at our disposal — not to mention air that construction workers can breathe — is much easier than setting one up on Mars. One of the solutions that NASA is considering for solar arrays is autonomous deployment mechanisms. That wouldn’t really work for nuclear power, which requires a more complex set-up that might even involve Martian water — assuming it’s available — to create reactants. You can imagine how complicated that would be. By comparison, solar power is easier, but not that much easier. “That’s a toughie,” says Weidetz. He estimates that most of the difference between the cost and construction of microgrids on Earth versus Mars will come from the power generation assets themselves, as opposed to the controls. The controls will probably be similar here and on the red planet and therefore easier to assemble. Weidetz says the only way we’ll overcome really difficult problems like this is by combining expertise and gathering lots of partners to work on these human missions to Mars. “It really is endless, almost, from a partnering standpoint, if you think of all the different organizations — public and private sector — with regards to who would contribute to populating a new planet.” Maybe NASA will end up seeking construction advice from construction companies like, say, Bechtel or Fluor. What it might look like when a small slice of Mars is lit up with power, as imagined by Siemens. 4. Can solar panels be versatile, depending on colony location? Solar arrays will be much easier to pull off near Mars’s equator than its poles. At those darker areas, the arrays would need to be much bigger and therefore more expensive, more cumbersome to construct, and harder to maintain. Weidetz says that’s the beauty of a microgrid: It’s small-scale, so it can be tailored to the specifications of certain areas. Solar arrays imagined on Mars, as imagined by Siemens. 5. How will Mars colonizers make repairs to solar panels? What if there’s a giant dust storm that prevents humans from venturing outside their settlements to maintain a microgrid or fix malfunctioning parts? The more that we can automate our maintenance systems, the less of a problem this will be. But Weidetz emphasizes two other points to consider: energy storage and weather forecasting. On Mars, we’ll want to prioritize safety before cost, meaning that we should buy whichever rechargeable batteries, fuel cells, or other storage mechanisms will last long enough to definitely get us through an emergency. If the most ambitious plans of groups like SpaceX prove true, a human mission to Mars could be only nine years away. That means we will need to have the power situation figured out as soon as possible. If Weidetz and other researchers are right, many of the biggest challenges can be addressed by drawing on our experiences back here on Earth.